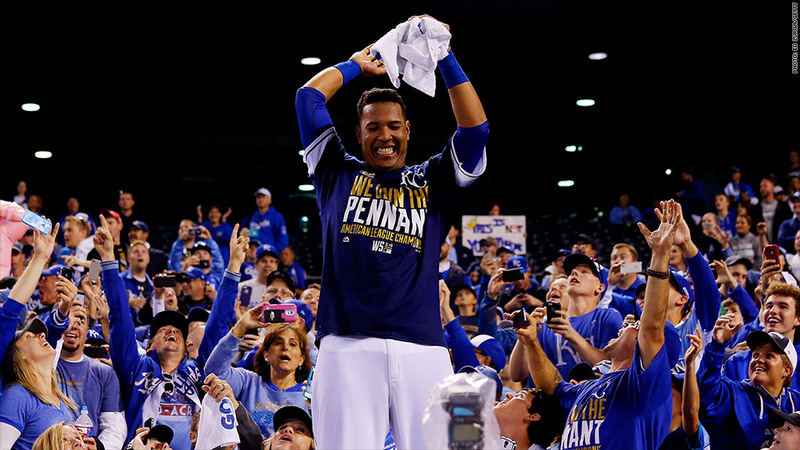 Royals catcher Salvador Perez celebrates with fans after the team won the pennant. Kansas City fans will pay more than $1,000 on average to watch the team in the World Series. Kansas City Royals fans, eager to watch their team play in the World Series for the first time in 29 years, are paying top dollar for the first two games of the Series. SeatGeek, which tracks online resale prices for tickets, said the average price for games 1 and 2 next week is $1,062, the highest seen for the Series' opening games in the five years for which it has data. San Francisco, whose Giants will face Kansas City in the Series, is home to a much wealthier and larger fan base. But unlike Kansas City, which was last in the Series in 1985, San Francisco has been home to two World Championships since 2010, and so Giants' fans are not as eager to see their team. They are paying an average of $803 for tickets to the two guaranteed games there. The cheapest ticket for the Series opener Tuesday night in Kansas City was $697 paid for standing room, according to SeatGeek. A standing room ticket for game 2 went for $664. The standing room tickets and upper deck outfield seats have a face price of $165, while the most expensive face price is $450 for a seat right behind home plate. The previous high price for tickets to the start of a World Series was the $888 average for the first two games of the 2010 World Series, which was also played in San Francisco. A year ago, Boston fans paid $762 on average for tickets to the first two games of the Series there.